A few years back I ran across this cute idea from Better Homes & Gardens. I found it in their magazine and cut it out. I checked on their website, but couldn't find a picture of them. 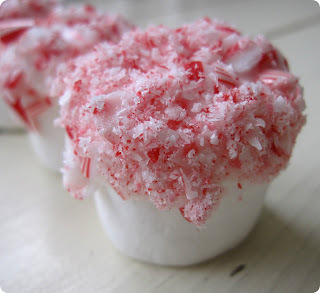 Anyway, I fell so in love with the marshmallows that I even did some for January (with blue crushed candy canes) and February (pink marshmallows with red and white candy canes). I just realized that candy canes come in every color imaginable these days. The rainbow colored candy canes on marshmallows would be cute for a birthday party. Wait until the day after Christmas and then go stock up on candy canes (last year I got several boxes for a quarter each) in varying colors. Mix 1 cup of powdered sugar with 3-4 teaspoons of water. Mix until a smooth, thin, glue-like consistency is reached. Crush the candy canes and put them in a bowl. I usually put only part of the candy canes in the bowl at a time. 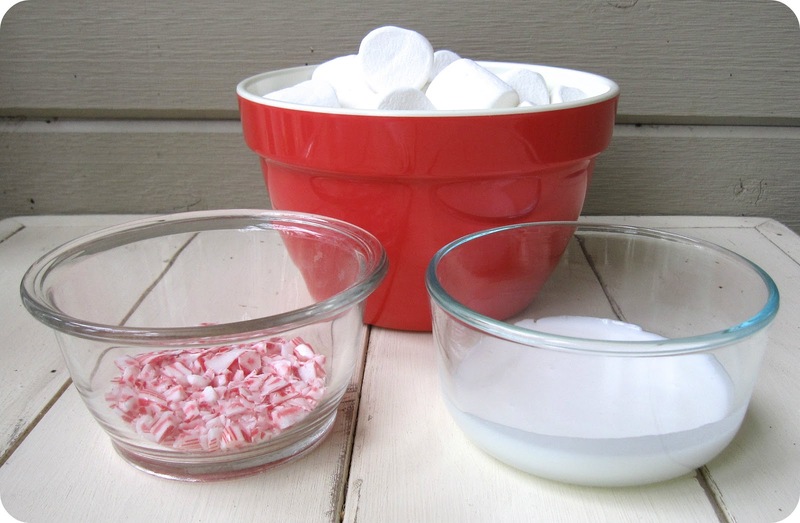 The powdered sugar mixture can make the candy canes a bit sticky after several dips. Dip the tips of the marshmallows in the powdered sugar mixture and allow to drip over the bowl. When dripping has stopped, dip the marshmallow in the crushed candy canes. Set marshmallows on a piece of foil (candy cane side up) until dry. I have tried dipping the miniature marshmallows, and they work as well. They're a bit more tedious, but doable. 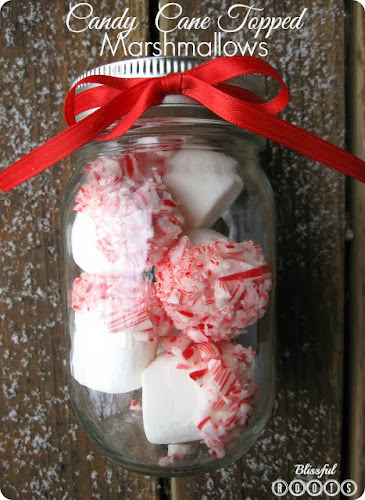 I've given these as gifts with hot cocoa mixes, and often just put them in a cute jar for decorating. I love making red and white candy jar displays this time of year! 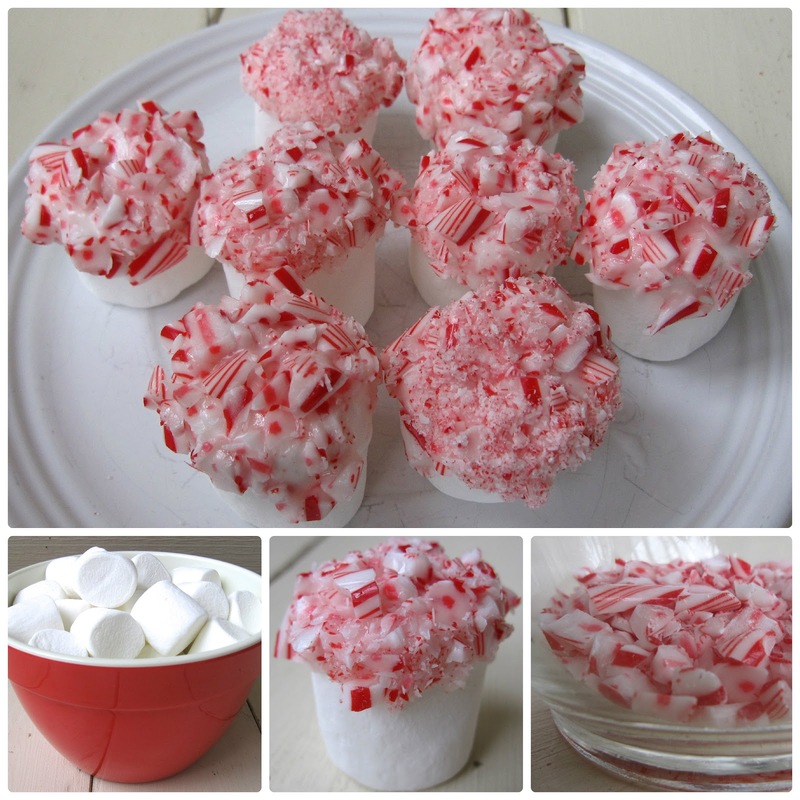 What's your favorite way to use candy canes? P.S. I've been featured again, and I'm a bit giddy again. Sweet Karri at My Life's a Treasure featured my Christmas countdown blocks. Thank you, Karri! Go check her out. This will be perfect to add to the hot chocolate bar I'm doing at my daughters preschool. Thanks for sharing at the Our Favorite Things Link Party.